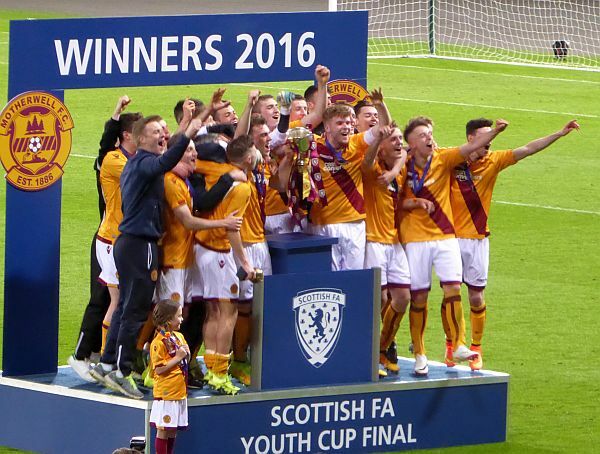 Motherwell kicked off and pushed up to win a corner inside the first minute. Thomas delivered but Captain Cadden's effort flew high. It did not take long for our opponents to impose themselves and they looked good with some fine passing moves. We took the lead after 20 minutes. A charge up the right wing by Thomas was ended by a clumsy challenge and we were awarded a free kick 25 yards out close to the touchline. Thomas delivered high and deep and Hall's header fell for Mackin to prod home. The goal came after a decent spell from Hearts but that did nothing to stop the cheers from the Motherwell half of the main stand. 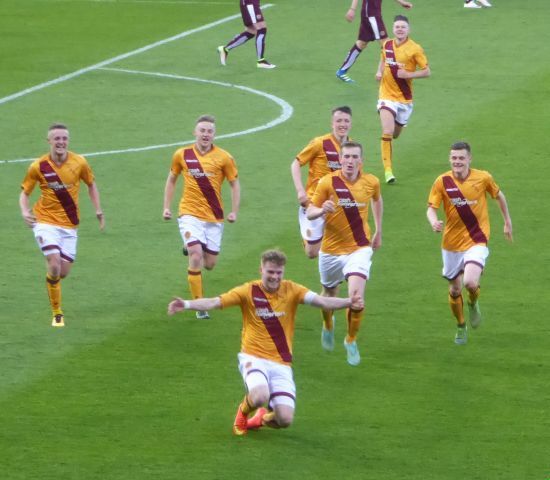 It was to get better in 37 minutes when Campbell got the ball to Cadden inside the 18 yard box. His shot was deflected beyond Mason and we had a two goal lead. Hearts got fair reward for their persistence and decent football when they were awarded a free kick dead centre and 19 yards from goal. McGhee drove beyond Long to make the score 2-1 at the interval. there were half chances at either end. Long had to make a couple of saves but the pace of Cadden and the trickery of Thomas posed a constant threat. Our third goal arrived in 67 minutes following a corner on the right. Thomas had skipped by a couple of defenders on the dead ball line to win the award and the delivery ended up at Ferguson's feet. He slammed it high into the net for a 3-1 lead. The gap was reduced to one before Hearts could make their double substitution. Hall slipped and Zanatta pounced. He had the freedom of our box and rounded Long to make the score 3-2. To the credit of the Hearts' team they stuck to their task but our back line held firm. Campbell thwarted a number of attacks from his deep position and promptly found a team-mate. Falconer scored the fifth with 89 minutes on the stadium clock. It was another well taken finish. This time he lifted the ball over the 'keeper to cue loud choruses of Twist and Shout from the 1,500 'Well fans.